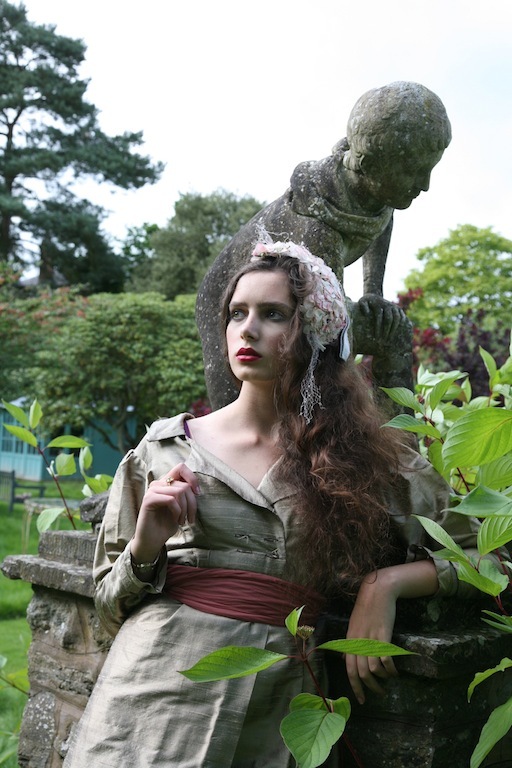 My outfit above is a pure homage to Corrie Nielsen's SS13 Florilegium collection. 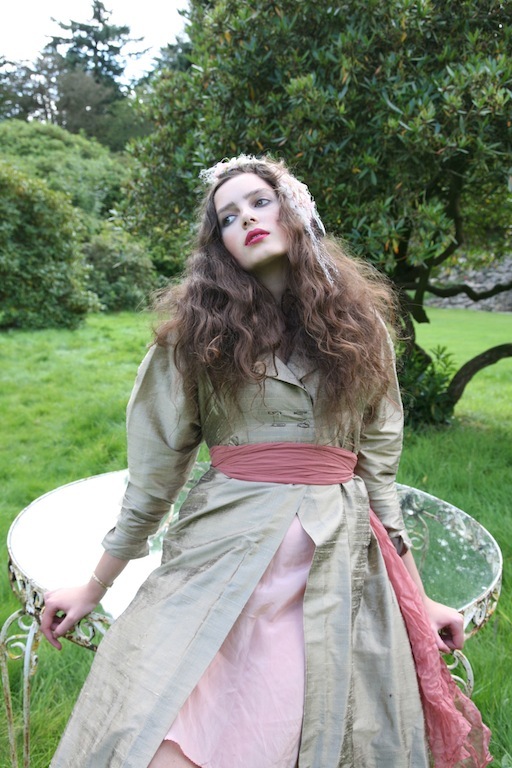 I immediately thought of this gold Edwardian-style coat-dress, which was made by an incredibly talented family friend, for the sheer joy of creating something. Thank you Heather! The silk slip was my great-grandma’s, the floral headpiece is vintage and the shoes were from eBay. 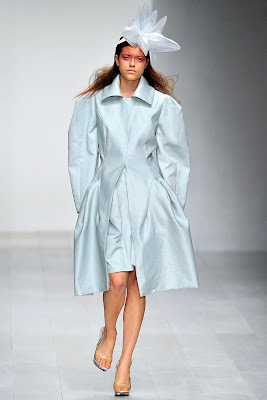 The catwalk photos of Corrie Nielsen's SS13 show at LFW are from Vogue.co.uk - for more images and a review written by the lovely Jessica Bumpus you can see the link here. Photographer: Christopher Dadey. 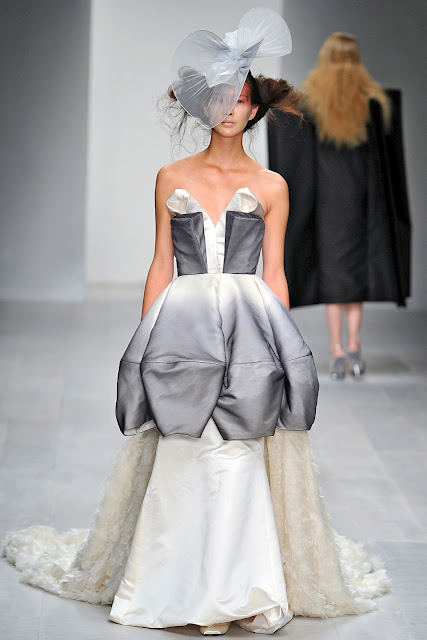 I was overwhelmed to sit front row at Corrie Nielsen’s mesmerizing SS13 show during London Fashion Week. Titled Florilegium, it was inspired by Kew Gardens – transforming botany into an art form through the shapes and details of the dresses. I’m always intrigued by the narratives behind Corrie’s work. Every collection tells a tale. There is also something about her designs that suggests and stimulates creativity in other mediums. She is supremely talented – for me, one of the most exciting current designers in the UK. I was also lucky enough to meet and talk with her several months ago, so I will definitely be re-visiting her work and vision in the near future. The grass was wet, but the sun was warm. She could feel the damp breath of dew under her cheek. She opened her eyes to flowers. She was close enough to stare through the petals and into the narrow core of each lily – stamen and pollen magnified in the early morning glow. She was resting on a lawn. Last time she had seen those beds of flowers they were just smudges in the dusk. They had blurred as she rubbed her eyes and sank down onto her knees. Now her papers and books were splayed around her, the pages speckled with water spots. She stretched, rubbing feeling back into her hands and arms. Her thoughts spun as she squinted, trying to remember how she had moved from sitting down to falling asleep in Kew gardens. Thank goodness they had given her license to stay as long as she needed to study the greenhouses and gardens. She had felt a shiver of wonder pass through her when she was first set loose with her notebook, pencil and paints. Now everything looked different in the honey-coloured light, the gladioli softer and the peonies brighter. It felt out of place to resume the sketches of sepals and anthers, or listings of tulip variations. She left her materials where they were, instead untying her boots and stepping through the grass with curled toes. Dawn soaked the sky. As she explored, rags of knowledge flapped through her mind. She thought of floriography - the language of flowers. She smiled as she snapped off a single white lilac. Youthful innocence – it was appropriate. She tucked the flower behind her ear, and sprinkled a handful of gardenia petals behind her. She paused as she reached the palm house, admiring the glitter of the glass, the white lines curving like the struts of a boat. The door gave way with a gentle push, and she tiptoed in among the humid foliage. The place hummed with a heavy stillness. It was serene. She felt detatched from the Latin names, the impersonal lectures that wrapped everything in vines of definitions and diagrams. Life wasn’t in the study. It was all here, growing quietly. Her fingers scrabbled towards the nearest plant. She peeled and plucked until she had an armful of fresh leaves. She began to tuck them around the edges of her dress, weaving them together into fans of green. Then she pushed back outside and ran towards the next display of flowers. Now she was frantic, grabbing at daisies and carnations, hibiscus and harebells, adorning herself in colour. Pinks, blues, creams: a frenzy of petals, ragged edges and frills falling across her face and arms. Finally she tore and tripped her way to the rose garden, determined to beat the sun as it climbed over the trees. She arrived panting and stood at the edge of the path. Her hair shivered in the wind, tangled. Pale yellow roses blocked the way, the thorns like claws. She reached over the massed bank to pull at one dusky coral rose behind. She caught sight of her delving hands and watched them in fascination. They were green, with faint lines running up towards her elbows. She saw her legs were the same. She turned pale as her body began to ripple. Silk turned into soft blossom, the satin of her skirts retracting and bulging into petal shapes. She wanted to laugh, but even whispers were impossible. Instead she stretched and bloomed as birds began to sing. Some three hours later the gates were opened and the warden made his rounds. He had a flask of coffee swinging by his side and a cap pulled firmly over his ears. Thank you so much for all the get-well wishes. I still managed to hobble to and from LFW, albeit in sensible flat shoes with painkillers in my bag! Corrie Nielsen's S/S 13 collection looks simply wondrous - an embodiment of the beauty of feminity, purity and, of course, botany. Your responses - both the shoot and the narrative - are nothing short of the brilliance I have come to associate with you, Roz! Also - I am so glad to hear that you are recovering and that LFW wasn't too arduous. This is such a beautiful story, the ending was really special. I think I've only read two or three of your short stories, have you posted any others on here before them? Absolutely lovely outfit (and great inspiration) those heels are amazing - as well as the whole look. Beautiful photos and backdrop too, I feel like these photos have an edge of children's literature. You look absolutely gorgeous and it's good to read your foot is better. As always the story is amazing! You are such a great writer, I wish I was half as good! I love your beautiful coat. Such amazing sleeves. 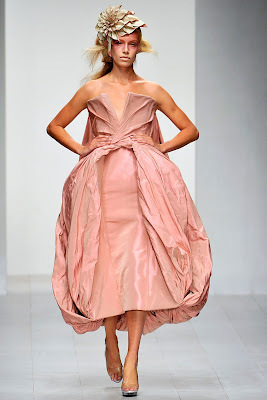 I hadn't heard of this designer but love the general lightness and attention to fabric. so glad your on the mend, I did wonder how you coped at LFW! I loved the flow of this post, first marveling at the gorgeous colors and richness of the fabrics, your creative styling, and lush makeup. Then catching my breath when I saw the exquisite designs that inspired your look. I pictured you throughout the story, and had to smile at the end. Lovely. MY toes were curling on that early morning grass, as well. Glad to know you're healing. And your writing is, as always, very descriptive and lush. Inspiring post as usual. I'm glad you were able to make it to London despite your injury and hope it's feeling better! I love the sleek, yet soft lines of your outfit. It's a very wonderfully put together ensemble (as is the poem). I don't normally associate words with apparel, but in a way, I think you captured the essence of the poem you wrote in the photos above it. Nicely done! PS - Sorry to hear you had a rough time pain-wise at LFW. But glad you're feeling (hopefully) a bit better! What a beautiful homage - rags of knowledge, hair shivered in the wind, even whispers were impossible - the imagery is captivating. I loved how you narrated the coming of age of Corrie and how you compared her to the most unique and uncommon flower in the garden ! How a creation finally takes shape...the process was described beautifully. And you are looking stunning ! When I admire Your beaufitul outfits, the landscapes on Your photos, Your writing about a country life - everything so charming, 'old England' styled, I think You should be the member of landed gentry (maybe my image of them is too stereotypical). So forgive my silly question - are You? When I admire Your beautiful outfits, the landscapes on Your photos, Your writing on country life - all so charming and 'Old England" styled, I always think You should be the member of the landed gentry (or maybe it's too stereotypical image of them I have). So forgive my rather silly question - are You? Your words are as beautiful as your images. I especially loved the line: It was all here, growing quietly. Thank you for this lovely moment. 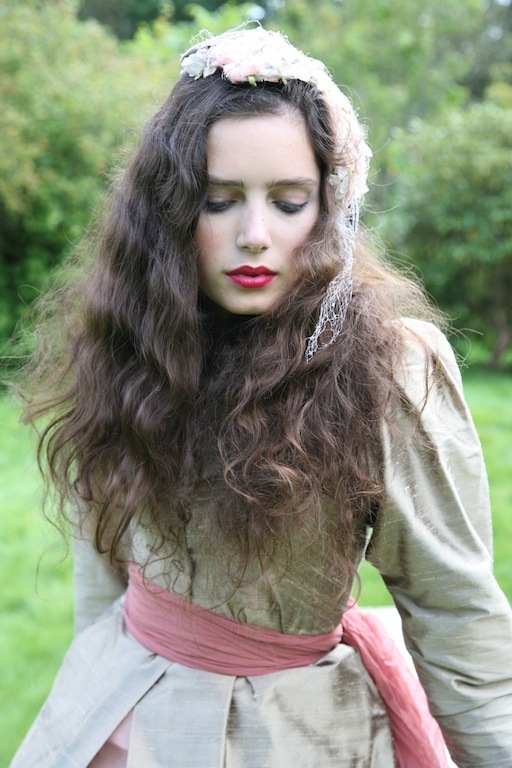 Gorgeous styling - I LOVE your hair and shoes in these pics - so pretty! Fragrant, floral prose. And I just love the sound of the word "floriography". It makes me think of swirling handwriting ending in petalled flourishes. It was wondrous to read of the "birth" of that last Corrie Nielsen gown, perhaps as regaled by the flowers to you! 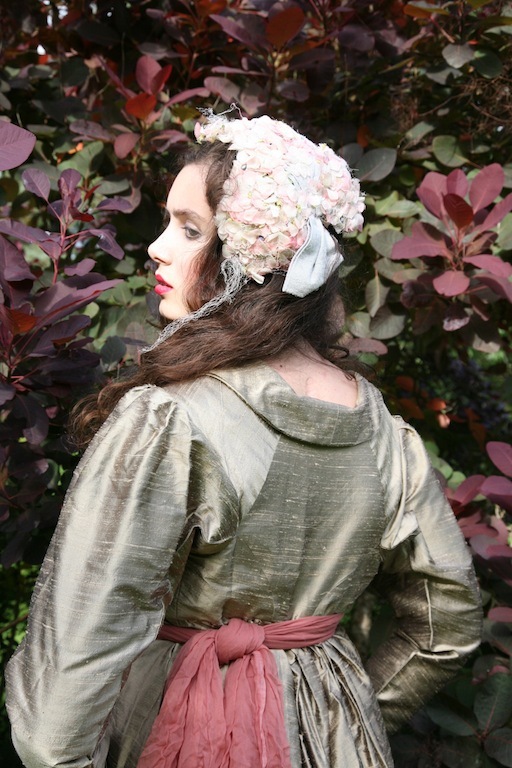 What a talented friend to have crafted a divine Edwardian coat, in what seems to be shantung silk! I love the lush backdrop of your English garden too. Ours is looking rather brown and ragged from the summer and nibbling deer.